After multiple surgeries, Ronald Poppo, the victim of ‘Miami cannibal’ Rudy Eugene is back on his feet. Doctors from Jackson Memorial Hospital showed pictures of 65-year-old Ronald Poppo assisted by two hospital workers helping him walk around. The pictures show the victim back on his feet, and the extent of his injuries are still visibly shocking almost a month after the incident, even after multiple surgeries. The lower half of Poppo’s face, roughly from mustache down, appears intact. Doctors said approximately 50 percent of his face was missing, and that the “extremely charming” Poppo remembers the attack, understands that he is in hospital, and is aware of media coverage. Plastic surgeon Dr. Wrood Kassira said the medical team’s primary goal to date has been to clean and close Poppo’s wounds, but her patient has had a “logical” response to conversations about reconstructive surgery. “We have mental health professionals to help him with the coping, and he’s coping remarkably well,” she said. 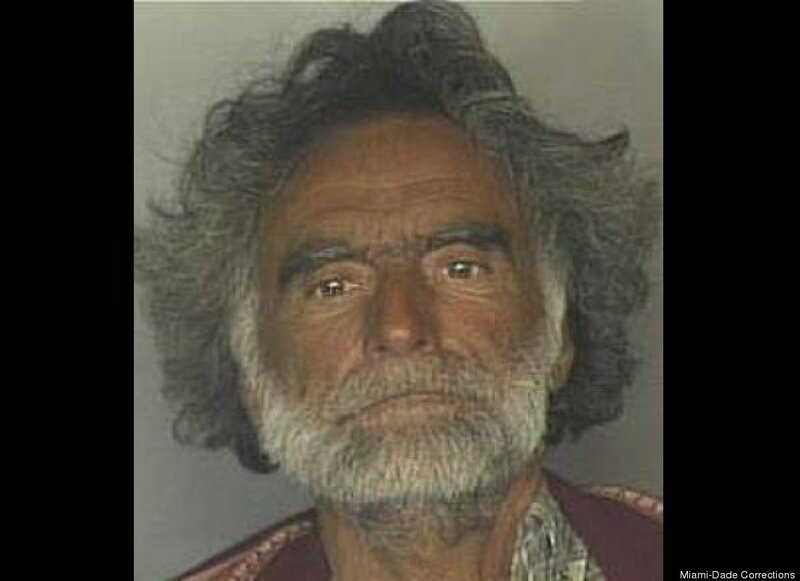 Poppo, who is believed to have been homeless in Miami since the mid-to-late 1970s, is covered by Medicare and Medicaid, officials said. A fund set up by the hospital foundation to assist Poppo (details below) has so far raised $15,000. The AP reports Poppo, who requests Italian food and can’t wait to go swimming, has asked that the television in his room be turned off except to follow Miami Heat games. Poppo was lazing on the MacArthur Causeway’s westbound Biscayne Boulevard exit ramp sidewalk May 26 when attacked in broad daylight by naked 31-year-old North Miami Beach resident Rudy Eugene, who was caught on surveillance camera trying to strip off Poppo’s clothes before brutalizing his face. A police officer responding to multiple 911 calls from drivers and cyclists shot and killed Eugene when he reportedly ignored orders to stop chewing Poppo’s face. An autopsy reportedly discovered Poppo’s flesh in the so called “Miami Cannibal”‘s mouth, but not in his stomach. Police have speculated that Eugene may have been under the influence of a synthetic drug, but a full toxicology report is still pending. Check out HuffPost’s full coverage of the crime for more details. HOW YOU CAN HELP: The Jackson Memorial Foundation has set up a fund to assist Ronald Poppo in his recovery, which experts in facial reconstruction have said will include lengthy treatment, staged reconstruction, and psychological care. Donations can be made by check or online at jmf.org.